Homeplace is a 7 bedroom beach retreat with a completely enticing Outer Banks locale. Situated at MP 12 in upscale Old Nags Head Place, Homeplace is centrally located to make the most of your time on the Outer Banks. Everything you need for a relaxing and adventurous vacation is well within reach, as beach shops, local restaurants, and fun attractions for the entire family are just around the corner. When coupled with the suite of amenities that are waiting at home, this vacation rental is a true treasure for vacationers who want to experience all aspects of fun on the OBX. 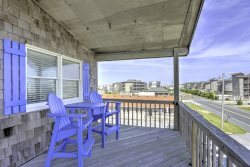 It’s just a short 3 minute direct walk to the beach through the beautifully landscaped community walkway, and visitors will also be just a shell’s throw away from the Nags Head Fishing Pier, Kitty Hawk Kites, and Jockey’s Ridge State Park, ensuring miles of entertainment in every direction. Prefer to stick close to home? The private, in-ground pool (10’ x 25’) is ideal for playtime with the kids, and the hot tub offers the perfect opportunity to relax and unwind after a great day filled with beach activities. Step inside the ground level from the expansive pool area, and keep the fun going in the recreation room with Flat Screen TV, newly-felted pool table, and a handy wet bar with full fridge and microwave. There’s also two pyramid bunk bedrooms on this level, both with TV/VCR, a queen master bedroom with TV/VCR, and a full hall bathroom for extra convenience. The second level features three bedrooms that are nicely quiet corners of this vacation estate. There’s a Queen Master Bedroom with large 32” inch TV, as well as two additional Queen Bedrooms that share a full bath. Best of all, two of the bedrooms have balconies to the front porch of the house for some extra relaxation time that’s enhanced by a cool sea breeze. The top level great room has a little something for everyone, ensuring it will be a popular spot to unwind for family members of all ages after a long day at the beach. Family chefs will adore the kitchen that features two refrigerators and two dishwashers, and everyone can enjoy a big meal at the dining area that seats 8-10, (and the adjacent bar seating with room for 4.) The living area is both cozy and comfortable, with a fireplace, a 40” inch Flat Screen TV and DVD/Stereo with surround sound, and a Queen sleeper sofa, while a queen master bedroom with a flat screen TV/DVD, Jacuzzi tub, and shower will be the perfect retreat for regal family members. There’s also a beautiful and inviting deck where everyone can relax together, and simply soak up that abundant Outer Banks sunshine. From walking-distance access to the fishing pier to a centrally located beach boardwalk, Homeplace allows visitors to effortlessly explore all the sites that make Nags Head a world-renowned beach town. Enjoy all the comforts of home and then some in a delicious central locale, and discover all the finer points of an all-encompassing Outer Banks vacation. The house is very nice. Wish the master bedroom would have had a king. Perfect for at least 3 couples & some children. Pool & hot tub are nice. The master bedroom mattress is not the most comfortable. Kitchen is nice & has plenty of dishes & silverware. Pots & pans should be updated. Need a few more drinking glasses. Very convenient to the beach. Easy 5 minute walk. Love that the house is dog friendly. We love taking our fur babies on vacation. We would rent again.